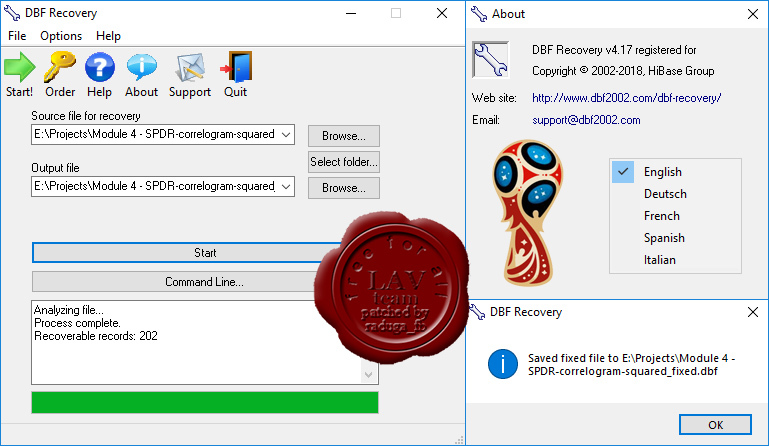 DBF Recovery the powerful, compact and easy-to-use tool for recovery corrupted DBF files. Unlike most of the competitors, DBF Recovery not only fixes headers but also analyzes actual data structures and tries to fix them too. You don't need to have any skills in restoring DBF files to use this program. It determines file formats automatically. The program recognizes all of the formats used by popular DBF processing applications: Dbase III/IV, Foxpro, Visual Foxpro and others. A completely automated recovery engine uses its artificial intelligence to repair damaged files as accurately as possible. DBF Recovery does not require external drivers for connection to databases (ODBC, BDE). Advanced CSV Converter allows you convert CSV files to DBF, Excel spreadsheet (XLS, XLSX), TXT, SQL, XML, Fixed Text and RTF. Working with the program takes as little as opening a file or selecting a folder with CSV files, choosing conversion settings and clicking the "Convert" button. The, the application takes the given CSV file or files and automatically converts data fields from them to the specified format. Advanced XLS Converter provides a the quickest, easiest and affordable way to convert Excel (XLS, XLSX, XLSM) files to a great variety of database formats, including DBF, TXT, HTML, XML, CSV, SQL, RTF - all with a few clicks of the mouse! Excel Converter does not require Microsoft Excel!